This gal is a Welsh Centauress. There may actually be a few in the wild over there too! Like Shetland Ponies, Welsh Ponies are a stocky short breed of pony. This G4 blended with that body well. Her hair is Kishka. Saddle? Who needs one! This Elf lass, being young, is not used to seeing shiny scalps on anyone. Well male pattern baldness seems to occur in several species of people! She can't keep her hands off his ol head and he isn't minding the scalp massage a bit! Heh! A more developed scene with the bald centaur and Elf. seen this a few times, and though Centaur’s are not something I look into, I did thought “hey. why not”, I mainly just play with Genesis (1), so for this I used adamr001 genesis_v4_centaur.zip, also wanted to try with the Foal, and with a G1F teen I created. Seems I have some more reading, like do I parent Foal to Genesis, or Genesis to Foal. And so far I might have to create my own poses from scratch. Good looking result! I would think that your base Figure will be the horse, foal, bigcat, dragon or what have you. So you parent the human to the base. When moving the two around, you would be moving the animal Figure. Seems easier. I wonder if it really makes any difference to the software which is parented to which. Um, scale of the parented Figure will be at issue too. I tried both to see what happens, G1F needed to be parented to the Foal, here I parent to the Neck1, if I went any other location on the Foal, G1F body ended up around the Foal's Shoulders, but neck1 worked keeping in place. Oh and I remember when the Centaur thread was alive and kicking high!! It's possible to have that again but we all have to remember to pop in ,Oh and McG lovely ladies lovely !! Big thank yous to CauriB for her work. Carrie58; I can't use those new horse shoes and Mocasins. DS 48 only. In the horse dressage and high class racing circuits, those would be indespensable. But where I come from, they'd get a strange look then forever ignored in real life. Lots and lots of mud around Houston. ;) I have turned the old iron shoes into silver, brass, bronze and gold. So they will hold up for a while. I still have visions of getting my troupe together and having a Thunderdance. So much for Flatleys Riverdance! LOL! This was done in DS 3.0Advanced 64 bit. Well, they SAID it was 64 bits! 8 gigs of ram is barely enough to handle that scene without crashing. And everything was just creeping and crawling along. Now I don't load a scene up that heavy. Ah, I got that remap now, will check that out later, thanks! Ok you're using Studio it seems. That one behaves differently than Poser in these areas. BUT, yes all the upper (human) Figures are parented to the Neck1 of MilHorse and MilFoal. Dont know about Horse2 yet, haven't been trying much with it for a few reasons already mentioned. With the Gen3 and Gen4 Figures I have no problem using saved poses. You aren't expecting a horse pose to affect the human or vise versa, are you? Cause that sure don't work. Dont forget, scaling will be an important thing. As far as Genesis 1 stuff, I never used it. Skipped over that and use some G2F. I don't use G3F, it is for DS 48 only. SO. Where are you at as far as Gen 3 and Gen 4 Figures with MilHorse? See you just have to be careful who's saddle you get on !! not much for Gen4, and nothing from Gen3. never could get what I wanted out of the Gen4 figures, but just clothes and hair, I started with daz about a month after Genesis went live, I had tried once a couple years before that, but after the third day I uninstall DS3.something something. I'm still wanting a few more items for Genesis1, I'll more likely skip G2F&M and pick up on G3F&M after I have purchased what I have left to get for Genesis. HEH . . if I tried to get basically the same for G2F&M like I have for Genesis 1, Genesis 5 would probably be out by the time I can start getting stuff for Genesis 3 . I just don't have the funds to keep up. [blink blink] ACK! Beats me! I don't recall exactly which hair ponytail I used. But both HEMI and AdamR001 beat me to it. They gave me the idea to do that. Looking through all my Hair, there are easily a half dozen great candidates for use as a horses tail. V4 Aditi looks like a good one, and it also has a hairband that goes with the ponytail base. Yeah, after looking through all my hair, (what a line!) I recall using Aditi. And it may have been what THEY said they used and I am repeating them yet again. THEN after looking through all 3 of my 'Big Time' 3D stores I realized why I couldn't find where I'd bought this excellent Propschick Hair set. It is in the Rendo freebies! I dunno if the moderators will allow the link in here any more but its worth a shot: https://www.renderosity.com/mod/freestuff/?search=Aditi ; and it will give you the place you select that hair item to dl free. :o) That hair band also has morphs to make it fatter, thicker, longer, thinner so the ponytail can be a foot from the head if ya like. Gosh I must have burned out fifty brain cells remembering all that stuff! LOL! Smells like burnt pizza in here now. Oh, I just HAD pizza pizza for brekkie this morning. He he he! On making the halves stick together better: What I do is, after getting the two put together in their default 'kit' positions and after doing the fitting adjustingment dial twiddling thing to both the horse and human, I next select the human HIP then go to Menu>Object>LOCK OBJECT. That way, no matter where you move the horse to or how you pose it, the human part stays where it is supposed to 99.99% of the time. On those new horse shoes: I have learned that getting things from DS into Poser is, at best, questionable adventure. I prefer that the content creator create the needed Poser files. That is an excellent 'bronco' scene Carrie58! Don't ya love the way the Girl4 just seems to match up perfectly to the MilHorse Neck1?!? HEMI's kits are terrific, they make the job of putting two Figures together as one creature easy and even enjoyable. So I read the even number pages, you read the odd number pages, and together we read the book! Hmm. I think of these as "Generations", not "Genesis". Less confusing. I use the Generation 3 era Aiko 3 and TY2 even now. They make nice centaurs, actually. Generation 4 Vicky, Michael and Kids. Generation 5 is unuseful for me. Generation 6 is useful, I rank its usability up there with V4. And until someone creates a way to load Generation 7 directly into Poser, the Generations END at 6 for me. Yes I have compared G3F to G2F in DS 48, and frankly, find G3F lacking. Then I remembered WHY G3F was created and just think "Oh. Right." and close that book. So here I am using Aiko 3, TY2, V4, M4, K4, G2F and G2M with Millennium Horse, Millennium Big Cat and with those will spawn dozens if not hundreds of variants of HEMI426 "Kit" Taurs in Poser. THAT is the book I work in. It is quite enough to play with, likely to the end of my short days. The one thing I am looking to do now for my 3D stuff is to build a newer, faster PC with a lot more ram in it. There is no method (YET!) in use that allows a single pose to modify two Figures at the same time. You will be using two poses to get the look you want. I often start with a saved or canned pose then tweak it a lot to get my folks looking like I want. It does mean going back and forth between the Horse and Human tweaking here, a little there and so on. Sometimes a lot. BUT. Doing this in 3D is so much more satisfying than drawing or painting. I have always loved sculpting clay. And sculpting in 3D on a PC is even better because it is so much more versatile. You can make changes quickly, easily. Got a new idea? Not a problem! Just do it on the fly. Not as easy to do in clay. Especially if its fired already! Sculpting in the PC isn't as messy either! What does affect both Figures is relocating them in the scene. Select the base Figure and change its coordinates and its there instantly. While we have discussed some of the issues with the Horses, maybe we can come to a useful answer to this one. HEMI introduced the long legged look with the Teen V4/MilHorse Centauress a few years ago. I think that really long legged look is excellent, and truly resembles the Arabian breed pretty close. But there is a problem with that in the MilHorse, and it's worse with Horse2. Check this image out. The arrow and circled areas show where the joints in the legs are looking kind of dislocated. I was wondering if anyone has a way to eliminate this in the Figure via some posing or scaling or setting I have missed. TIA! Thanks Kerya! That makes a LOT of sense, and while it is a bit of a chore, I do it once and save the Horse Figure out with a new name and just use that one anytime I want the long legged look. This will do great with the MilHorse. Not so sure about Horse2 (Genesis Horse). Oh I definitely love Hemi's kits but ........ummm well these are Genesis and DAZ Horse2 , and the human male is Genesis as well while Willow ( sitting on the rail) is Genesis2F ........I fell in love with Genesis,cause I could transfer ALL of my V4 ,M4 morphs to Genesis ,and still use the textures .But I've actually found I like a bit more cartoony look to the figures ,not never quite there realistic ...........I got into 3d while looking for inexpensive models for my polymer clay sculpting , well it's been a bit more expensive then I had planned ...but it has been a barrel of fun!! 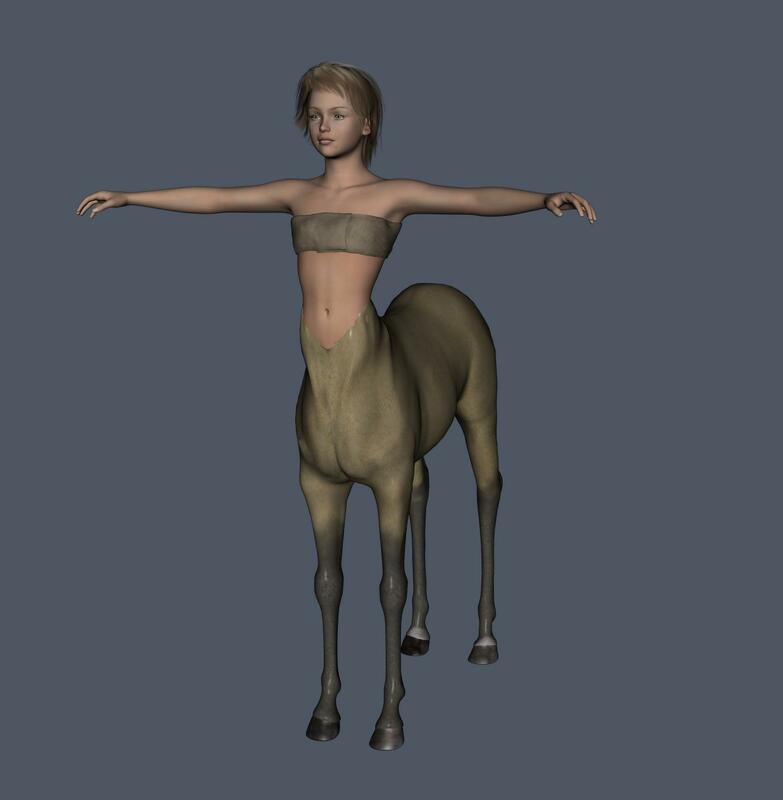 I'm thinking it might be worth rendering centaurs twice, for the human skin extending a little further, then the horse extending a little further, and then some fancy work with layers.